Do lifestyle videos positively impact brand advertisers? Does alignment with lifestyle video content improve a woman's overall affinity for a brand? 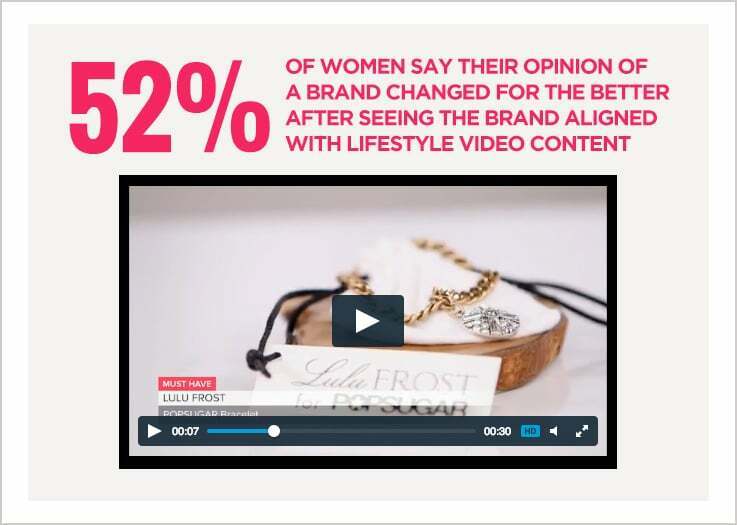 We wanted to find out, so as part of the POPSUGAR Insights/ulive 2014 lifestyle video study, we asked women to tell us if seeing a brand advertised during a lifestyle video had changed their opinion of the brand and if so, how it had been changed. Overall, 43% of women have had their opinion of a brand changed by seeing the brand advertised in lifestyle video content. Certain demographic segments, like younger millennials between the ages of 18 and 24 (52%) and households with children (52%), were more likely to say that their opinion of a brand had been changed. Category enthusiasts (women who said they were very interested in content related to a specific lifestyle category) were also more likely to say that they had their opinion changed by seeing the brand aligned with lifestyle video content. In particular, parenting (55%), fashion (53%), beauty (52%), and entertainment enthusiasts (49%) were more likely to say they had their opinion changed than women overall. Avid lifestyle video consumers (women who stream 240+ minutes of lifestyle video per month) were also more likely to say their opinion of a brand had been changed (55%). Next, we wanted to understand how many of those women who said they had their opinion changed had it changed for the better, so we asked for additional details about the nature of the change they experienced with brands. Overall, the majority of women said that their change of opinion in relation to a brand was a positive one, with women saying that they now "liked the brand more," that "learning more about the brand improved their opinion," that the advertisement "made them want to buy/try it," and that they were "interested in learning more." Another 29% of women had a neutral experience, saying that as a result of the advertising they "learned more about the brand," but it hadn't swayed their opinion about the brand into the positive column. Interestingly, single women under the age of 35 were slightly more likely to say that they had their opinion of a brand changed for the better (57%), as were students (59%). Among specific lifestyle category enthusiasts (women who expressed that they were very interested in specific lifestyle content categories), entertainment (59%) and travel (57%) enthusiasts were more likely to have had their opinion changed for the better, followed closely by fashion, beauty, and wellness/fitness enthusiasts (55%). Perhaps surprisingly, avid lifestyle video consumers (women who stream 240+ minutes of lifestyle video a month) were less likely to have had their opinion of a brand changed for the better (47%).